Rich Boren of the Hudson Force 50 Third Day and La Paz Cruisers Supply wrote us with an update on the loss of Bob Smith and his catmaran Pantera. Rich reports: “I’ve been emailing back and forth with Bob Smith’s daughter who today received the DNA testing results back confirming that the body found on the beach around Nov 20 was indeed Bob Smith from SV Pantera. The family is of course devastated, and sadly, they don’t have money to pay for a proper cremation. Lori and I are going to pay for it either by ourselves or by raising some money from his friends. We knew Bob and it’s the least we can do for him and the family. Folks wanting to donate a few bucks toward his cremation can send them to my PayPal account at Svthirdday@yahoo.com. Any extra money will be donated to a local kids charity in Bob’s name. Bob Smith’s homebuilt Pantera, racing in the 2008 Banderas Bay Regatta, was always one of the fastest ‘cruising’ boats in the fleet. Bob Smith was a talented, gregarious and revered member of the Mexico cruising community who built his high-tech, super-fast cruising cat in Vancouver. He singlehanded from British Columbia to Mexico and back several times, sailed in the Baja Ha-Ha, and enjoyed over a decade of cruising Mexico and the Sea of Cortez. After almost 30,000 miles, 12 dropouts, something like four rescues at sea (are we forgetting one? ), and the most grueling singlehanded racing in recent memory, the 50th Anniversary Golden Globe has a winner. Jean-Luc Van Den Heede sailed across the finish line in Les Sables-d’Olonne, France, yesterday to claim first place. In addition to line honors, the 73-year-old JLVDH became the oldest person to win a singlehanded nonstop circumnavigation, beating Sir Robin Knox-Johnston’s mark; Knox-Johnston was 68 when he sailed the Velux 5 Oceans Race in 2007. 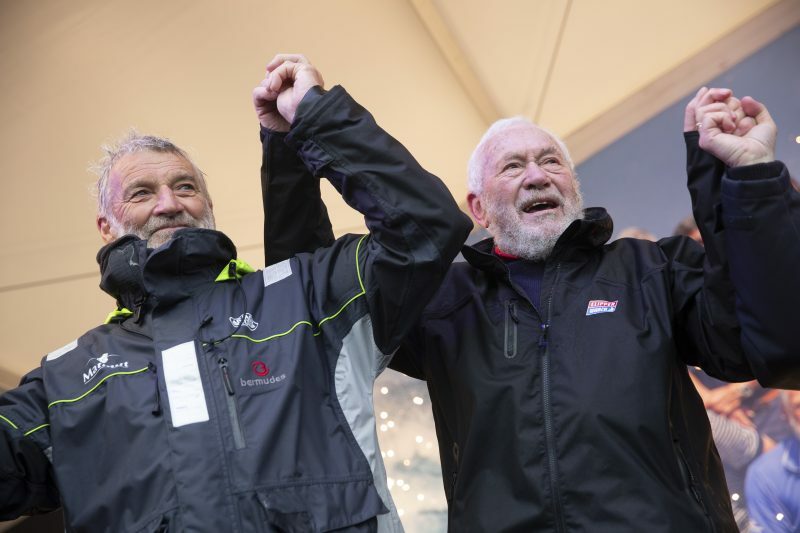 Jean-Luc Van Den Heede (left), winner of the 2018 Golden Globe Race, celebrates with Sir Robin Knox-Johnston in Les Sables d’Olonne yesterday. The 73-year-old Frenchman completed the 27,000 mile race in 211 days 23 hours 12 mins 19 seconds — 100 days faster than Knox-Johnston’s Suhaili in1969. From the blast of the starting gun back in July, Van Den Heede was a dominant force in the retro-styled reboot of the Golden Globe, taking an early lead and looking untouchable around two thirds of the planet. 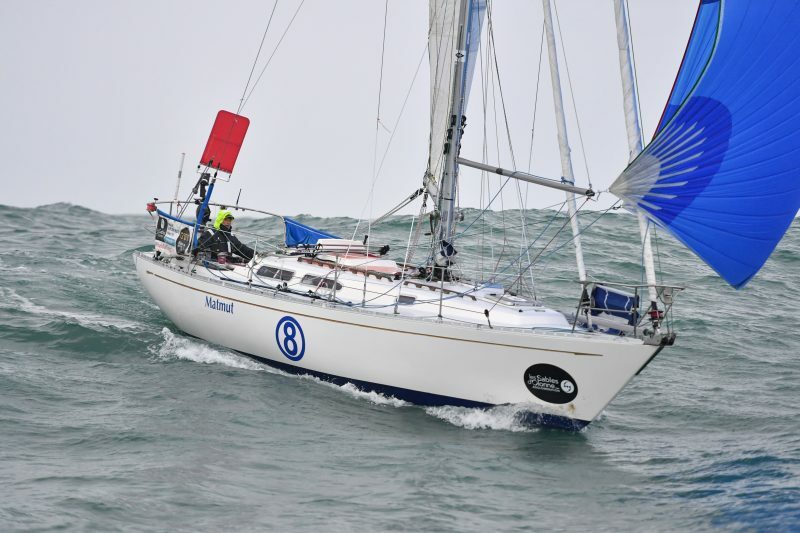 “At one point, he and his Rustler 36 yacht Matmut had built up a 2,000-mile lead over second placed Dutchman Mark Slats, until [Van Den Heede] pitchpoled during a ferocious Southern Ocean storm some 2,000 miles west of Cape Horn,” the GGR press release said. “He and his yacht survived the ordeal, but when she righted herself, Jean-Luc was devastated to find that the pressure on the bolt holding the lower shrouds had torn a 10-centimeter-long [almost four inch] hole down the mast section.” After contemplating a pit stop to make his repairs, Van Den Heede eventually figured out how to repair the damage at sea. That’s when second-place sailor Mark Slats started closing the gap. As they approached the Azores archipelago off Portugal, JLVDH’s lead was down to just 50 miles. Jean-Luc Van Den Heede and his Rustler 36 Matmut surf down a wave toward the finish line on Tuesday. And don’t forget the rest of the fleet. Estonian Uku Randmaa is still over 3,000 miles from the finish, followed by Hungarian-born American Istvan Kopar, who has 4,000 miles to go. Rounding out the fleet is Finnish sailor Tapio Lehtinen, who has yet to round Cape Horn. Southern California fleets get busy in February. Twenty-five clubs are gearing up to host the SCYA Midwinter Regatta on February 9-10 and 16-17. As part of that immense event, San Diego Yacht Club will host the Pac52 Midwinters on February 8-10. 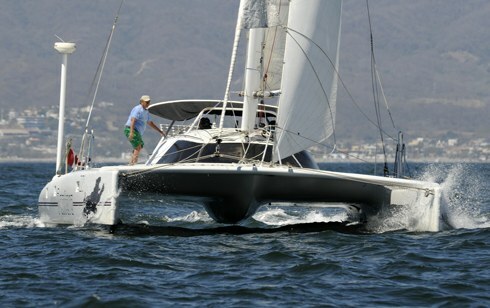 SDYC will also welcome the TP52 and the Beneteau First 36.7 classes. Alamitos Bay YC in Long Beach will host the Laser Masters Midwinters West on February 16-17. On February 15-16, Newport Harbor and San Diego YC will co-host the 10th annual Islands Race, a 134-mile run from Long Beach around Catalina and San Clemente Islands to Point Loma, which some teams may use as a warm-up for the Newport to Ensenada Race on April 26-28. Innocent Merriment, Horizon and Adrenalin in the Islands Race. On Friday, February 23, starting at noon, a clinic will precede that weekend’s California Laser Masters. Mission Bay YC in San Diego will host. In Northern California, ongoing Midwinter Series racing continues, with the Perry Cup Series for the Mercury fleet wrapping up on February 2 in Monterey. RegattaPRO Winter One Design and Berkeley YC Midwinters will conclude on the second weekend of the month. BYC will give top finishers a chance to compete to be the ‘Champion of Champions’ in a Winners Race on Sunday, February 24. The J/105 fleet jockeys for position on the RegattaPRO Winter One Design start line on January 12. 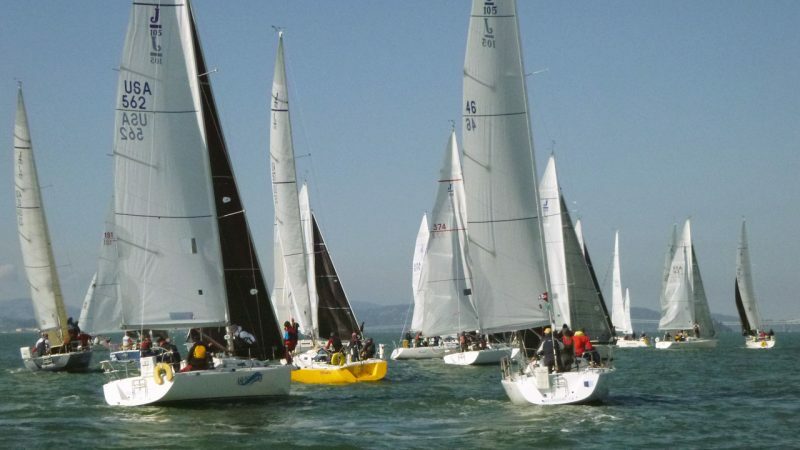 On the weekend of February 9-10, Treasure Island Sailing Center will welcome the junior set for BAYS Winter Series #3. The Corinthian Midwinters‘ second of two weekends will be on February 16-17. Multihulls line up for their start in Belvedere Cove at last year’s SSS Corinthian Race. The SSS will present awards and shirts for the Three Bridge Fiasco at Oakland YC in Alameda on Wednesday, February 6, at 7:30 p.m. 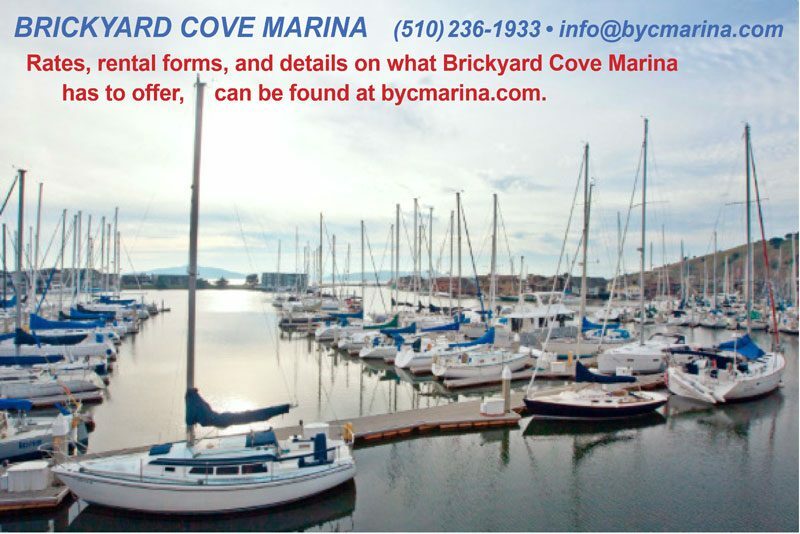 The second installment in the SSS series for singlehanded and doublehanded crews will be the Corinthian Race on February 23, a Bay tour starting and finishing off CYC in Tiburon. See you out there! This year's Three Bridge Fiasco, sailed on San Francisco Bay on Saturday, January 26, was nowhere near the Fiasco it could have been. For instance, during last year's race a raging ebb sucked most boats out the Gate, and only four entries out of 317 starters were able to finish. 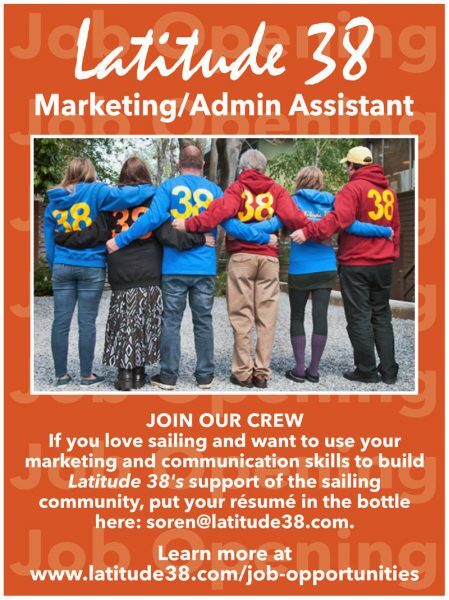 Latitude Nation — Can you ID this boat? Help Roger Krakow identify his Mystery 20. Abandoned Boat or a Dream Lost? It’s always unnerving when going for an evening stroll on the beach and discovering an abandoned sailboat.